Most of Tom Helsel's career has been spent as an inspector-in-charge for PennDOT while spending winter re-assignments in various divisions such as the bridge room. He also spent five winters in maintenance as both a foreman and as an acting assistant. 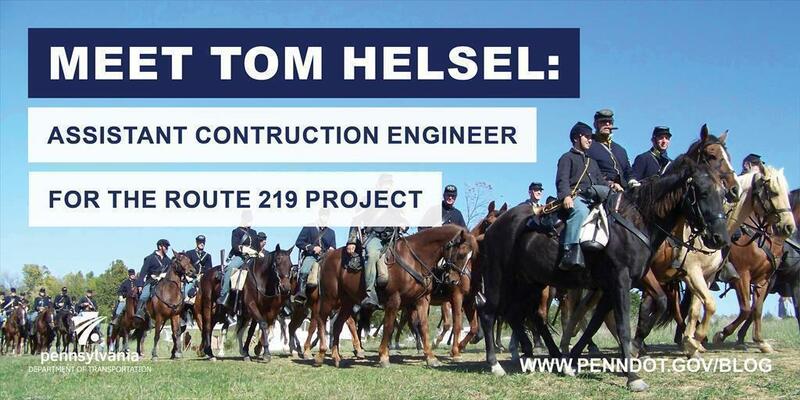 For the last five years, Helsel has been the assistant construction engineer for the Route 219 Project in Somerset County. This is a $236 million project that has been broken into three contracts — earthwork, structure, and paving — and is set to be completed this fall. The project consists of the construction of 11 miles of new four-lane limited access highway on new alignment between Somerset and Meyersdale. The project includes 10 million cubic yards of earthwork, six dual structures, and two new interchanges. The Buffalo Creek bridge dual structure is now the highest structure in PennDOT’s District 9 at 220 feet. Helsel works out of the field office for the project and is the only permanent PennDOT employee on the project. His inspection staff consists of consultants and he has as many as 23 people on board at any given time, including PennDOT Engineering Scientific Technical Interns (ESTI) and Civil Engineer Trainees (CET). Helsel explained that he started his own career with PennDOT as an intern. "I had one summer as an ESTI with PennDOT in 1985 and I liked being able to work outside and see projects being built,” he said. “My father was a mechanical contractor and I was used to working in a contract environment growing up. I learned a lot of things about reading plans, specifications, preparing estimates, and working to install systems." Helsel says his greatest accomplishment with the department goes back to the late ‘90s when he was the inspector-in-charge of the $53 million Meyersdale Bypass project in Somerset County. The project won three state awards including the Project Recognition Award for the top project in Pennsylvania. It also won the National Quality Initiative Gold Award and the American Road and Transportation Builders Association Award. Helsel’s talents also saw him serve for two years on the Statewide Senior Inspector in Charge conference committee, where he was chairman in 2000. He resides in Somerset county with his wife of 29 years, whom he met when he worked in the department’s Philadelphia-area District 6. With his wife being from the Philly area, and his in-laws still residing there, there is a big east/west division that occurs. But according to Helsel, his wife roots for the correct team — the Steelers. The couple has two children — a daughter who is getting married in September and will be moving to Italy for two years as her fiancé is stationed there for the Navy, and a son who is starting 10th grade this year. When not working, Helsel spends time at his farmette tending to horses, chickens, three dogs, eight cats, a bearded dragon, and a potbellied pig. He says it's like a second full-time job keeping up with all of his animals. Helsel and his daughter also are Civil War Reenactors with the 2nd U.S. Cavalry Company A. They use two of their horses at live reenactments and living histories. Last year, Helsel sadly lost his cavalry horse and is currently working on training a new one to get used to the idea of gun fire. "Flying across a battlefield with a saber or revolver in hand at the line of gray clad confederates on horses can be very interesting to say the least,” he explained. Helsel and his son also recently joined a newly formed Laurel Highlands Squadron of the Civil Air Patrol.